Dr. Myriam Ruthenberg teaches Italian literature, culture and language at all levels in an Italian Studies program that she created and became official in 1993 with what was then the second of only two B.A. programs in the State of Florida. She served as Chair of the Department of Languages, Linguistics and Comparative Literature from 2003 to 2008. She holds two teaching awards and a university Leadership Enhancement Award, and more recently she became the recipient of the university-wide Faculty Talon Award "in recognition of exceptional leadership, commitment and service to FAU." 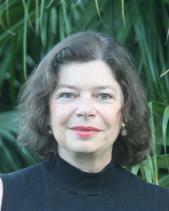 She has served on the editorial board of professional journals in her field. She was Treasurer of the American Association of Italian Studies for three years. In 2007 she was knighted by the Republic of Italy, which granted her the title of "Cavaliere nell'Ordine della Stella dellla Solidarietà italiana." Without ever abandoning her love for Boccaccio and the post-Boccaccian novella, Dr. Ruthenberg has concentrated her research on the writer, translator and cultural critic Erri De Luca. The latter became the topic of several articles, an edited volume titled Scrivere nella polvere: Saggi su Erri De Luca (Pisa: ETS, 2005), and the first English translation of one of this author's works (The Senses of Memory). Re-writing lies at the core of her published research on the early Renaissance novellatore and chronicler Giovanni Sercambi, and her articles on Elsa Morante and Tomasi Di Lampedusa focus on the recasting of respectively Medieval and Renaissance texts in a twentieth-century mold. She is currently working on an authored book, titled Erri De Luca e la scrittura alla vigilia della creazione. Scrivere nella polvere: Saggi su Erri De Luca. Ed. Myriam Swennen Ruthenberg. Pisa: ETS, 2005. Print. Italian Cultural Studies 2001. Eds. Anthony Julian Tamburri, Myriam Swennen Ruthenberg, Graziella Parati, Ben Lawton. Boca Raton: Bordighera P, 2004. Print. "'Cantando narrare': Healing Melancholy in Decameron X,7." Atti del convegno 'Umana cosa è aver compassione degli afflitti ...': Raccontare, consolare, curare nella narrative europea de Boccaccio al Seicento. The University of Turin, December 12-14, 2013, Levia Gravia. Alessandria: Edizioni dell’Orso (2015): 61-72. "The Tale of Ricciardo and Catella (III.6)." In 'The Decameron' Third Day in Perspective. Eds. Francesco Ciabattoni and Pier Massimo Forni. The U of Toronto P (2014): 108-30. "'Eccomi' sulla spiaggia-confine di Tu, mio: Erri De Luca, il mare e l'asciutto." Narrativa. Université de Paris X, Nanterre 20.21 (2001): 169-80. “Modi narrativi e stile del 'Novellino' di Masuccio Salernitano” by Donato Pirovano. pp. 284. Firenze: La Nuova Italia, 1996. Modern Language Notes 115.1 (2000): 137-41. Print. “From Water to Dust: A Dehydrating Essay on Erri De Luca.” Differentia: A Review of Italian Thought. 1.1-2 (1999): 51-59. Print. “Coming Full Circle: Romance as 'romanzo' in Elsa Morante's L'isola di Arturo.” Modern Retellings of Chivalric Texts. Ed. Gloria Allaire. London: Ashgate (1999): 147-63. Print. “Prove di domanda: Intervista silenziosa con Erri De Luca.” Gradiva 1.7 (1999): 51-62. Print. “Death of an Epic, Death of an Epoch: Ariosto and Tasso in Tomasi di Lampedusa's ‘Il Gattopardo’” Forum Italicum 32.2 (1998): 403-26. Print. “Romancing the Novel: Elsa Morante's ‘L'isola di Arturo’.” Romance Languages Annual 9 (1997): 336-41. Print. “Erri De Luca, il Libro e la Lingua.” Il Veltro 40.3-4 (1996): 311-15. Print. “Il realismo poetico di Pier Paolo Pasolini in 'Ragazzi di vita'.” Carte italiane 4 (1984): 37-52. Print. The Senses of Memory. Trans. of De Luca, Erri. I colpi dei sensi. Rome: Fahrenheit 451, 1993. 24 pp. Chelsea (1999): 44-57. Print. “Tufa” translation of “Tufo” by Erri De Luca in Cusani, Cristina. Tufo, Exhibit catalogue. Pica Gallery Naples (2012): page number unknown. “Trees that walk” text by Erri De Luca, for Oh!Pen, May 2014 (subtitles). “Open City: Seven Writers and Rome.” Ed. William Weaver. South Royalton, VT, 1999. 460 pp. Palm Beach Post. September 12, 1999.